The cost of scrapping Fukushima Daiichi will remain squarely on Tepco’s shoulders. TOKYO — Japan is considering having new electricity suppliers shoulder some of the cost of compensating those affected by the 2011 Fukushima Daiichi meltdown — a first since the market was opened up to companies besides the big regional utilities. The expense has been covered by interest-free government loans to Tokyo Electric Power Co. Holdings, which operated the disaster-stricken nuclear plant. This debt is being repaid not only by Tepco, but also other major power companies such as Kansai Electric Power and Chubu Electric Power. Some 6 trillion yen ($57 billion) has already been paid out, more than the 5.4 trillion yen estimated in fiscal 2013, and the total is expected to rise by trillions of yen. With consumers gradually switching from regional utilities to independent power providers, the Ministry of Economy, Trade and Industry plans to ask these new players to pay a share of the compensation. Details such as how to split the burden between established and new power providers will be worked out going forward. New suppliers’ customers will be asked to contribute as well, on the grounds that they used nuclear power before the market opened up, though this could meet with a backlash from some of the companies affected. But the cost of scrapping Fukushima Daiichi will remain squarely on Tepco’s shoulders, and the ministry will not approve rate hikes to recoup these expenses. Annual outlays are expected to soar to hundreds of billions of yen, from 80 billion yen now, once Tepco starts extracting melted fuel from the reactors in the 2020s. The ministry plans to set up a fund to cover decommissioning costs, with the money to come from Tepco’s yearly profits. The utility will be permitted to draw from the fund to cover approved decommissioning plans. Funding gaps will be covered by government loans to be repaid by Tepco. The company will be exempted for the time being from a requirement to cut electricity transmission charges levied on electricity retailers if profits from power transmission and distribution rise too high. The aim is to avoid placing a further burden on taxpayers while ensuring that decommissioning goes smoothly. Kagoshima Governor Satoshi Mitazono responds to questions from reporters at a news conference at the prefectural government building on Oct. 28. KAGOSHIMA–Despite campaigning on a pledge to immediately suspend operations at the Sendai nuclear plant, Governor Satoshi Mitazono has now accepted the scheduled restart of a reactor there amid mounting pressure from the plant operator. After being elected in July, Mitazono twice called on the utility in August and September to immediately shut down the plant in Satsuma-Sendai in the prefecture for additional safety checks. Each time, the company turned him down. Mitazono stopped making a similar request to the company, saying he would likely receive the same response. After the No. 1 reactor went offline early this month for regular maintenance, the media focus has shifted to whether the new governor would accept the reactor’s scheduled restart around Dec. 8. A governor does not have the legal authority to order a halt to the operation of a nuclear power plant. Mitazono, a former TV journalist, won the gubernatorial race due, in part, to growing calls from the public for extra safety checks on the plant and the overhaul of the existing evacuation plan, which was compiled by his predecessor. Concerns about the soundness of the plant mounted among voters since a series of powerful earthquakes struck Kumamoto Prefecture, Kagoshima Prefecture’s northern neighbor, in April. Many of the roads and other infrastructure were damaged in the temblors in Kumamoto Prefecture, hindering residents from swiftly evacuating. At that time, the No. 1 and No. 2 reactors at the Sendai plant were the only two units operating in the nation. They were the first two reactors signed off on meeting the new regulations set after the 2011 Fukushima nuclear disaster. Mitazono’s news conference was the first since he gave one in late July right after he took office. He had signaled previously that he would decide on the restart of the No. 1 reactor based on the discussion of an expert panel he intended to set up at the prefectural government to examine the safety of the Sendai plant. But he stopped short of laying out a specific time frame for forming the panel. “I am hoping to do it as soon as I can,” he said at the news conference. The governor has yet to submit a budget request needed to assemble the panel to the prefectural assembly. The prefectural assembly is expected to convene in late November in the next session, meaning that the panel will not be established ahead of the No. 1 reactor’s restart. Mitazono also said he expects to inspect the Sendai plant alongside other experts on nuclear energy next month. The inspection is aimed at examining details of “special checks” Kyushu Electric promised to conduct, in addition to the regular maintenance of the No. 1 reactor. The first round of negotiations on a nuclear ban treaty is expected to be held in March next year. The United States and other nuclear powers have indicated they will boycott the talks. But Kishida has said Japan will be at the negotiating table. Toshio Sano, Japanese ambassador to the Conference on Disarmament, meet reporters at the United Nations headquarters in New York on Oct. 27 after Japan voted against a resolution calling for negotiations on a treaty that would outlaw nuclear weapons. Japan’s vote against a United Nations resolution calling for talks on a treaty to ban nuclear arms has made a mockery of its pledge to lead the movement toward a world without nuclear weapons, as the only country that has suffered nuclear attacks. The U.N. General Assembly First Committee on Disarmament and International Security adopted a resolution to start formal negotiations next year on a treaty to outlaw nuclear weapons. In the vote, 123 nations supported the resolution, with 38 opposed. The United Nations’ decision to embark on full-fledged discussions on a legal framework to ban nuclear arms represents a historic move. But Japan, along with nuclear powers the United States, Russia, Britain and France, voted against the measure. Japan has been cautious about negotiating such a treaty. But its vote against the resolution is tantamount to declaring that it is now taking a position closer to those of the nuclear powers. It is hard to fathom the reason for Japan taking this extremely regrettable action. No wonder the Japanese government’s action has triggered a barrage of criticism by hibakusha, or the survivors of the 1945 atomic bombings of Hiroshima and Nagasaki, as well as various non-governmental organizations devoted to the cause of world peace both at home and abroad. It is obvious that the use of nuclear weapons is inhumanity at its worst. But there is no international law that bans nuclear arms. Austria and other non-nuclear states that have sponsored the resolution have made a convincing case for negotiating a legally binding instrument to prohibit nuclear weapons as a first step toward their elimination. The United States has expressed especially strong opposition to the move. The principal reason for Washington’s vehement objection is that the proposed treaty would disturb the delicate balance of international security based on nuclear deterrence. The United States has also called on its allies protected by its “nuclear umbrella,” including Japan and NATO members, to vote against the resolution, claiming that their security, too, would be affected by the envisioned treaty. As a result, South Korea, Australia and Germany, as well as Japan, were also among the countries that opposed the measure. The U.N. committee adopted a separate resolution promoted by Japan calling for gradual cuts in the global stockpile of nuclear weapons. The United States supported this resolution. Explaining Tokyo’s vote, Foreign Minister Fumio Kishida said starting negotiations on a nuclear ban treaty is inconsistent with Japan’s basic approach to nuclear disarmament. Many Japanese government policymakers believe the protection of the deterrent effect of the U.S. nuclear arsenal is essential for Japan’s own national security at a time when the security environment in East Asia is deteriorating due partly to North Korea’s continued development of nuclear arms and missiles. But the proponents of a ban treaty are not calling for an immediate end to dependence on the extended U.S. nuclear deterrence. These non-nuclear states are only advocating the beginning of talks on such a treaty. How to pursue both nuclear arms reductions and national security is a challenge the world should tackle through international negotiations. The nuclear powers are acting too inflexibly by opposing even the establishment of a conference for such negotiations. Japan and other U.S. allies that have followed Washington’s lead will face some serious questions about their independence. The resolution is now set to be adopted in a U.N. General Assembly session by the end of this year. The first round of negotiations on a nuclear ban treaty is expected to be held in March next year. The United States and other nuclear powers have indicated they will boycott the talks. But Kishida has said Japan will be at the negotiating table. The rift between nuclear and non-nuclear states is deeper than ever before. Japan should now try to play an active role in the efforts to narrow the gap between the positions of both camps by persuading the nuclear powers to join the negotiations. That’s the way for Japan to maintain the credibility of its commitment to the elimination of nuclear arms as the nation that was once devastated by atomic bombs. Representatives of groups of atomic bomb survivors protest the Japanese government’s opposition to the U.N. resolution to convene negotiations on a treaty banning nuclear arsenals at a news conference in Nagasaki on Oct. 28. Atomic bomb survivors lashed out at their government for siding with the United States and opposing the start of talks to outlaw nuclear weapons, despite Japan being the only nation to be victimized by nuclear bombs. “Japan ended up going along with the United States, which flexes its muscles with nuclear weapons,” said Toshiki Fujimori, an atomic bomb survivor of Hiroshima and a senior official at the Japan Confederation of A- and H-Bomb Sufferers Organizations, known as Hidankyo. Japan was among 38 countries that voted against it, along with the United States and other nuclear powers. Fujimori, 72, said Japan’s stance reminded him of the stinging criticism hurled at him when he visited the committee in New York early this month to press for the urgency of such a treaty. An ambassador of a non-nuclear power nation spearheading anti-nuclear arsenals efforts suggested Japanese should lobby their own government first if they were so keen to see the treaty take shape. The ambassador was criticizing that Japan, relying on the U.S. nuclear deterrence, was reluctant to support negotiations on the treaty from the outset. Fujimori also said he disagreed with what a Japanese foreign ministry official said at a symposium on nuclear disarmament in September. The diplomat described U.S. President Barack Obama’s historic visit to Hiroshima in May as an attempt to bridge the divide between nuclear and non-nuclear powers. And five months later, Japan, together with the United States, voted against the U.N. resolution. Tsuboi shook hands with Obama when he visited Hiroshima, the first sitting U.S. president to do so. But Washington pressured Japan, an ally, and other allied nations, to vote against the U.N. resolution when the step toward a nuclear ban was under discussion. Toyokazu Ihara, 80, who gave a peace pledge at the annual peace ceremony in Nagasaki on Aug. 9, said he “was appalled” by Japan’s vote against it. He said he urged Prime Minister Shinzo Abe to “act in a way only Japan can do” when they met after the ceremony. Nagasaki Mayor Tomihisa Taue said while he welcomed the U.N. resolution as a “landmark step” to pave the way for nations to forge a legally binding path to outlaw nuclear weapons, he “was extremely disappointed” by the Japanese government’s opposition to it. Hiroshima Mayor Kazumi Matsui echoed a similar sentiment. The Economy, Trade and Industry Ministry is planning to spin off Tokyo Electric Power Co. (TEPCO) Holdings Inc.’s nuclear power generation division and aim for an alliance between the new subsidiary and another power company. The ministry unveiled the plan at an Oct. 25 meeting of an expert panel on reform of TEPCO and issues related to the tsunami-hit Fukushima No. 1 nuclear plant. The possibility has emerged that realignment of the major utilities’ nuclear power divisions will be led by the government as the planned reactivation of idled nuclear reactors has stalled. As part of TEPCO reforms this past April, the company’s thermal power, power retail and power transmission and distribution divisions were transformed into subsidiaries and placed under the umbrella of the newly established TEPCO Holdings. However, TEPCO Holdings has retained its nuclear power division because the company needs to decommission the crippled Fukushima nuclear complex and pay compensation to victims of the nuclear disaster, which broke out in March 2011. Under the ministry’s plan, a subsidiary would be set up to take over TEPCO’s nuclear power business, excluding the Fukushima No. 1 plant, with an eye to forming an alliance between the new firm and another major utility. The costs of decommissioning the crippled power station’s reactors are likely to far surpass the initial estimate. The ministry released a revised projection at the Oct. 25 expert panel meeting stating that the annual decommissioning bill will likely balloon from the current 80 billion yen into the hundreds of billions, due to work to remove melted nuclear fuel from the reactors and other factors. The panel discussed TEPCO reforms to raise funds to cover the massive expense of dealing with the accident, such as compensation payments and decontamination of areas tainted with radioactive substances emanating from the nuclear disaster, plus decommissioning. The committee is aiming to increase TEPCO’s profitability by promoting the realignment of the firm’s nuclear power division and other cost-cutting efforts. TEPCO set up a joint venture, JERA Co., with Chubu Electric Power Co. in April 2015 to gradually integrate their thermal power station fuel procurement and overseas power generation divisions. TEPCO has also formed a business tie-up with SoftBank Group Corp. to bundle electricity and communications device contracts. The industry ministry furthermore proposed that TEPCO’s power transmission and distribution subsidiary, which is highly profitable thanks to a large number of customers in the Tokyo metropolitan area, strengthen its alliances with other utilities. The expert committee is poised to work out the details of a plan to spin off TEPCO’s nuclear power division and how the subsidiary should join hands with other companies. The panel will draw up a draft of its proposals possibly by the end of this year, and incorporate the recommendations in TEPCO’s corporate rehabilitation plan to be released next year. More humans than ever are exposed to higher levels of ionizing radiation from medical equipment, airplanes, etc. A new study suggests that this kind of radiation may be a confounding factor in the neurodegenerative disease Alzheimer´s. Alzheimer’s disease is the leading cause for dementia in the elderly, and its global prevalence is supposed to increase dramatically in the following decade – up to 80 million patients by 2040. – It is crucial that we investigate the potential factors behind this disease, says postdoc Stefan J. Kempf, University of Southern Denmark. His research focuses on possible connections between radiation and cognitive impairments. In a new study, he and an international consortia involving colleagues from Italy, Japan, Germany and Denmark show that low doses of ionising radiation induce molecular changes in the brain that resemble the pathologies of Alzheimer’s. The study has been published in Oncotarget. Co-authors are from Institute of Radiation Biology/Institute of Pathology, Helmholtz Zentrum München, German Research Center for Environmental Health and Institute for Environmental Sciences in Japan. Large numbers of people of all age groups are increasingly exposed to ionizing radiation from various sources. Many receive chronic occupational exposure from nuclear technologies or airline travel. The use of medical diagnostics and therapeutic radiology has increased rapidly – for example more than 62 million CT scans per year are currently carried out in USA. Approximately one third of all diagnostic CT examinations are scans of the head region. – All these kinds of exposures are low dose and as long as we talk about one or a few exposures in a lifetime I do not see cause for concern. What concerns me is that modern people may be exposed several times in their lifetime and that we don’t know enough about the consequences of accumulated doses, says Stefan J. Kempf. Recent data suggest that even relatively low radiation doses, similar to those received from a few CT scans, could trigger molecular changes associated with cognitive dysfunction. In their new study, the researchers have elucidated molecular alterations in the hippocampus of mice. The hippocampus is an important brain region responsible for learning and memory formation and it is known to be negatively affected in Alzheimer´s. The authors induced changes in the hippocampus by two kinds of chronic low-dose-rate ionizing radiation treatments. The mice were exposed to cumulative doses of 0.3 Gy or 6.0 Gy given at low dose rates of 1 mGy over 24 hours or 20 mGy over 24 hours for 300 days. – Both dose rates are capable of inducing molecular features that are reminiscent of those found in the Alzheimer’s disease neuropathology, says Stefan J. Kempf. When a patient gets a head scan, the doses varies between 20 and 100 mGy and lasts for around one minute. When a person flies, he or she gets exposure to ionising radiation coming from space but the rates are by far smaller than a CT scan. – When you compare these figures you will find that we exposed the mice to a more than 1000 times smaller cumulative dose than what a patient gets from a single CT scan in the same time interval. And even then we could see changes in the synapses within the hippocampus that resemble Alzheimer´s pathology. According to Stefan J. Kempf, the data indicate that chronic low-dose-rate radiation targets the integration of newborn neurons in existing synaptic wires. Paper: Chronic low-dose-rate ionising radiation affects the hippocampal phosphoproteome in the ApoE?/? Alzheimer mouse model. Forfattere: Stefan Kempf, Dirk Janik, Zarko Barjaktarovic, Ignacia Braga-Tanaka III, Satoshi Tanaka, Frauke Neff, Anna Saran, Martin Røssel Larsen, Soile Tapio. OncoTarget, 20. september 2016. Workers in protective gear remove the banner lauding nuclear energy in Futaba, Fukushima Prefecture, in December. AIZUWAKAMATSU, Fukushima Prefecture—Pro-nuclear propaganda signs that became the ironic symbol of a town evacuated in the 2011 Fukushima nuclear disaster have been moved to a museum’s storage ahead of their possible public display as a warning from history. The Fukushima Museum in this city took over care of the signs this month on behalf of the town government of Futaba, which co-hosts the crippled Fukushima No. 1 nuclear power plant. The most well-known of the banners, which residents campaigned to save, reads: “Genshiryoku–Akarui Mirai no Energy” (Nuclear power is the energy of a bright future). Yuji Onuma, a 40-year-old former resident of Futaba who now lives in Kogawa, Ibaraki Prefecture, came up with the slogan as a sixth grader at a Futaba school. The town hall adopted it to promote nuclear energy. Onuma, who fled the town amid the triple meltdown, said the move to the museum is welcome in terms of keeping them in good condition. “But I am hoping that they will be shown to the public as soon as possible,” he said. The signboards were removed between December and March along with other panels of slogans promoting nuclear energy in the town. The town government cited the danger of the tall steel structures collapsing because of old age. They had been kept in a barn wrapped in blankets until the prefectural museum came forward with the offer of storage space early this month. “The signboards will be kept from deteriorating at the museum where the temperature and humidity can be easily adjusted,” a Futaba official said of the transfer to the museum. The town hall had initially sought to remove and dispose of the prominent signs, saying they were nearly 25 years old and may fall off at any time. But after the town announced the decision to do so in March 2015, Onuma and other like-minded people scrambled to start a petition to call for their preservation as historically important items. “The signs should be stored and exhibited as a ‘negative legacy’,” said Onuma, who recalled that he had once been proud of co-hosting a nuclear power station as he believed it would lead the town to a promising future. But after the disaster, he decided he was wrong and switched to the solar power generation business in Kogawa. In the end, the town government agreed to preserve them after they were removed from the original site. A Futaba official said the signs could be featured at a facility to pass down the records of and lessons learned from the powerful quake, tsunami and the nuclear disaster which the prefectural government is planning to construct. Finally, 71 years after the dropping of atomic bombs that destroyed Hiroshima and Nagasaki, the international community is ready to start negotiations on a new treaty banning nuclear weapons. Although this is a historical moment, it was very sad that Japan and the US opposed the UN resolution. A UN General Assembly committee has approved a resolution calling for a treaty to ban nuclear weapons. Japan, the only country that has suffered atomic bombings, was among the countries that opposed it, along with nuclear powers including the United States. The resolution was adopted on Thursday by a majority vote at the General Assembly’s First Committee on Disarmament. The resolution submitted by about 50 non-nuclear weapons states calls for starting negotiations on a legally binding treaty in New York in March. 123 countries voted in favor, while 38 voted against. 16 countries abstained. Among the nuclear powers, the United States and Russia opposed it. China and India abstained. Japan voted against it. The country has been calling for the abolition of nuclear weapons, while under the US nuclear umbrella. But it said disarmament should be done in stages with the cooperation of nuclear and non-nuclear states. Austrian disarmament ambassador Franz Josef Kuglitsch called the resolution the fruit of years of huge effort and conscience-building by many countries and civil society. Austria is one of the proponents of the resolution. If adopted at a General Assembly session in December, treaty negotiations will start in March. UNITED NATIONS – A U.N. General Assembly committee on Thursday voted to launch negotiations on a new treaty banning nuclear weapons despite fierce opposition from the world’s nuclear powers. A resolution presented by Austria, Ireland, Mexico, Nigeria, South Africa and Brazil was adopted by a vote of 123 to 38, with 16 abstentions, following weeks of lobbying by the nuclear powers for “no” votes. Four of the five U.N. Security Council nuclear powers — Britain, France, Russia and the United States — voted against the resolution, while China abstained, as did India and Pakistan. Japan, which has long campaigned against the use of nuclear weapons, voted against it, as did South Korea, which is facing a nuclear threat from North Korea. Opponents argued that nuclear disarmament should be addressed within negotiations on the Nuclear Non-Proliferation Treaty. Beatrice Fihn, executive director of the International Campaign to Abolish Nuclear Weapons, described the vote as a “historic moment” in the decades-long drive for a nuclear-free world. The measure is expected to go to the full General Assembly for a vote in late November or early December. Although Japan voted against the resolution due to pressure exerted by the U.S., Foreign Minister Fumio Kishida said Friday that Japan intends to join U.N. negotiations to outlaw nuclear weapons. “At present, I hope to proactively join in the negotiations and firmly present our stance,” which stresses cooperation between nuclear and nonnuclear powers, Kishida told reporters, adding that the government as a whole will make the final decision. Kishida said Japan opposed the draft resolution as it did not match the country’s stance to pursue a world free of nuclear weapons by “concrete and pragmatic measures” amid the growing threat posed by North Korea’s nuclear and missile development and the need for nuclear deterrence. “The resolution further deepens the rift and encourages opposition” between countries possessing nuclear weapons and those that do not, Kishida said. Japan also took note of the votes by other key countries in making the decision, Kishida said. All of the countries possessing nuclear weapons, including the United States, opposed the draft resolution, while North Korea voted in favor. The resolution calls for talks to be held twice next year — the first round from March 27 to 31 and the second from June 15 through July 7 in New York — to negotiate a treaty to prohibit nuclear weapons. Despite the U.S. and other nuclear powers’ objection to the motion, Robert Zuber, director of Global Action to Prevent War, a nongovernmental organization, is upbeat about its prospects. “We believe that a ban treaty could help contribute to a robust international framework to which the nuclear weapon states could eventually accede,” he said. But the decision by Japan, the only country to have ever suffered a nuclear attack, to vote against the draft disappointed some anti-nuclear campaigners. The government is “still captured by a very old-fashioned idea on security. They still believe nuclear weapons are necessary for their own security. However, it is already clear that it is nuclear weapons that are posing a threat to global security and survival of human kind, as testified by many survivors of Hiroshima and Nagasaki,” said Akira Kawasaki, director of Peace Boat Hibakusha Project. United Nations member states have voted overwhelmingly to start negotiations on a treaty to ban nuclear weapons, despite strong opposition from nuclear-armed nations and their allies. In the vote in the UN disarmament and international security committee on Thursday, 123 nations were in favour of the resolution, 38 opposed and 16 abstained. Nuclear powers the United States, Russia, Israel, France and the United Kingdom were among those that opposed the measure. Australia, as forecast last week, and as a long-time dependant on the US’s extended nuclear deterrence, also voted no. The resolution now goes to a full general assembly vote some time in December. The resolution aims to hold a conference in March 2017 to negotiate a “legally binding instrument to prohibit nuclear weapons, leading towards their total elimination”. Support for a ban treaty has been growing steadily over months of negotiations, but it has no support from the nine known nuclear states – the US, China, France, Britain, Russia, India, Pakistan, Israel and North Korea – which includes the veto-wielding permanent five members of the security council. But Australia has been the most outspoken of the non-nuclear states. During months of negotiations, Australia has lobbied other countries, pressing the case for what it describes as a “building blocks” approach of engaging with nuclear powers to reduce the global stockpile of 15,000 weapons. Australia has consistently maintained that as long as nuclear weapons exist, it must rely on the protection of the deterrent effect of the US’s nuclear arsenal, the second largest in the world. Sadleir said Australia’s position on nuclear disarmament was “consistent and clear”. Professor Tilman Ruff, founding chair of the International Campaign to Abolish Nuclear Weapons and co-president of the International Physicians for the Prevention of Nuclear War, said the vote was a “historic step” for the world that “heralds an end to two decades of paralysis in multilateral nuclear disarmament”. “The numbers are especially encouraging given the ferocious pressure on countries to vote no by the nuclear-armed states, who see that this will fundamentally challenge their continued possession of nuclear weapons,” he said. Ruff said Australia should reverse its opposition “and get on the right side of humanity”. “Australia is doing dirty work for Washington, and is willing for US nuclear weapons to be used on its behalf, and potentially with its assistance,” he said. Ruff said that given there were no nuclear disarmament negotiations under way or planned, a ban treaty was the only feasible path towards ridding the world of nuclear weapons available now. The efficacy of a ban treaty is a matter of fierce debate. Without the participation of the states that actually possess nuclear weapons, critics argue it cannot succeed. But proponents say a nuclear weapons ban will create moral suasion – in the vein of the cluster and landmine conventions – for nuclear weapons states to disarm, and establish an international norm prohibiting nuclear weapons’ development, possession and use. Non-nuclear states have expressed increasing frustration with the current nuclear regime and the sclerotic movement towards disarmament. With nuclear weapons states modernising and in some cases increasing their arsenals, instead of discarding them, more states are becoming disenchanted with the nuclear non-proliferation treaty and lending their support for an outright ban. UN Resolution Calls for Ban on Nuclear Weapons http://www.voanews.com/a/un-resolution-calls-for-a-ban-on-nuclear-weapons/3569764.html U.N. member states have voted overwhelmingly on a measure that could lead to a ban on nuclear weapons. On Thursday, the U.N. Disarmament and International Security Committee voted to approve a resolution that calls for negotiations on a new treaty outlawing nuclear weapons, despite opposition from nuclear-armed nations. “This treaty won’t eliminate nuclear weapons overnight. But it will establish a powerful, new international legal standard, stigmatizing nuclear weapons and compelling nations to take urgent action on disarmament,” Beatriz Fihn, executive director of the International Campaign to Abolish Nuclear Weapons, said. Fihn said the vote was a “historic moment” even though convincing countries to eliminate their nuclear weapons will be very difficult. The non-binding resolution, presented by Austria, Brazil, Ireland, Nigeria, Mexico and South Africa was approved by a vote of 123 to 38, with 16 abstentions. Nuclear powers had lobbied for “no” votes. Who voted against it The United States, Israel, France, Russia and Britain were among the nations voting against the measure. China, India and Pakistan abstained. U.N. members will meet in December to vote on the resolution during a full general assembly. Nations against the measure say nuclear disarmament should be discussed during negotiations on the Nuclear Non-Proliferation Treaty. This resolution came after three international conferences that took place in 2013 and discussions by a working group on nuclear disarmament in 2016 that recognized the humanitarian effects of nuclear weapons. Mediterranean ecosystems will change to a state unprecedented in the past 10,000 years unless temperature rises are held to within 1.5C, say scientists. Southern Spain will be reduced to desert by the end of the century if the current rate of greenhouse gas emissions continue unchecked, researchers have warned. Anything less than extremely ambitious and politically unlikely carbon emissions cuts will see ecosystems in the Mediterranean change to a state unprecedented in the past 10 millennia, they said. The study, published in the journal Science, modelled what would happen to vegetation in the Mediterranean basin under four different paths of future carbon emissions, from a business-as-usual scenario at the worst end to keeping temperature rises below the Paris climate deal target of 1.5C at the other. Temperatures would rise nearly 5C globally under the worst case scenario by 2100, causing deserts to expand northwards across southern Spain and Sicily, and Mediterranean vegetation to replace deciduous forests. Even if emissions are held to the level of pledges put forward ahead of the Paris deal, southern Europe would experience a “substantial” expansion of deserts. The level of change would be beyond anything the region’s ecosystems had experienced during the holocene, the geological epoch that started more than 10,000 years ago. He said that while his study did not simulate what would happen to production of Mediterranean food staples such as olives, other research showed it was clear the changes would harm their production. Climate change has already warmed the region by more than the global average – 1.3C compared to 1C – since the industrial revolution. NUCLEAR UN votes to start negotiating treaty to ban nuclear weapons Australia votes with major nuclear powers against the resolution – including US, Russia and Israel – but 123 nations vote in favour. Causal connection between nuclear radiation and Alzheimers’ Disease – European research. A “nonsense” paper accepted for International Conference on Atomic and Nuclear Physics. The danger of war between USA and Russia now greater than in the cold war. USA and North Korea are talking, unofficially. Republicans’ foreign policy approach more moderate than that of Democrats. America DID use depleted uranium weapons in Syria. USA’s Energy Secretary Moniz promoting nuclear industry for all he’s worth. National and Texas groups unite against nuclear waste “interim” storage scheme. Investment firm Carlyle Group LP foresees end of nuclear power in USA, unless saved by tax-payers Closure of Fort Calhoun nuclear station will save $millions. Wind and solar power set to take over as Fort Calhoun nuclear plant closes. TVA Watts Bar Nuclear Workers Frightened of Raising Safety Concerns: US NRC Meets with TVA Officials on Nov. 3rd. SOUTH KOREA. South Korea’s anxiety: talk of pre-emptive strikes on North Korean missile and nuclear facilities. FRANCE. Japanese Flawed steel Components at the Center of French Nuclear Crisis – Major Questions &amp; Implications for Japanese Reactors Safety. JAPAN. Massive underestimation of Cost to scrap Fukushima nuclear plant Japanese officials admit. Outside power temporarily cut to Okayama uranium processing facility after quake. UK. Scottish power plant forced offline for a week by swarm of jellyfish. People Against Wylfa B say it’s ‘ironic’ the Japanese company behind the new plant are not building in their own country. Nuclear is an “old fashioned, dangerous and dirty technology” according to a group opposed to a new plant being built on Anglesey. Pawb (People Against Wylfa B) have responded to Horizon Nuclear Power’s latest consultation by questioning the Japanese firm’s commitment to construct the £12bn power station in view of no new nuclear plants being planned in Japan……..
Last year, the Prime Minister of Japan at the time of the disaster, Naoto Kan, visited Anglesey and urged residents to oppose the Wylfa plant. Dylan Morgan, a founding member of Pawb, said Hitachi, who own Horizon, are being “totally irresponsible” in persisting with its nuclear “obsession”. He added: “The technology is old fashioned, dirty, dangerous and very expensive. “It’s ironic that a Japanese company are so adamant that a reactor is built here in Wales, when they can’t do so in their own country. Britain hopes to showcase nuclear skills at Hinkley Point, Ft.com , 28 Oct 16 “………some in the industry have warned that setting up supply chains may not be straightforward. In France and Finland, new reactors are years late and billions over budget, in part because of problems with suppliers. When the Finnish Olkiluoto 3 reactor and French Flamanville reactors were started, neither country had built a nuclear plant for decades, leading to years of teething problems and criticism of components that were not up to standard. In 2008, the French nuclear safety authority asked EDF to suspend part of the project “as a result of the numerous deviations observed in the reinforcement or concreting of the foundation rafts”. It said this “highlighted a lack of rigour” and “problems with supervision”, singling out the oversight of a key Italian supplier. Russia and Myanmar this week established a working body for nuclear technology cooperation, according to officials. Little is known about the bilateral taskforce, including who is involved or even how many members are included. The two countries signed a memorandum of understanding (MoU) to cooperate in nuclear technology for peaceful purposes in June last year. According to a Ministry of Education official, the working body is another step in developing nuclear technology with the help of Russia. Russian government officials are now in Nay Pyi Taw to discuss further steps for the MoU, said U Khin Maung Latt, director general of the Department of Technology Promotion and Coordination (DTPC) under the Ministry of Education. “We have a roadmap of further steps for the MoU … We have discussed and agreed for further cooperation,” he said…….. 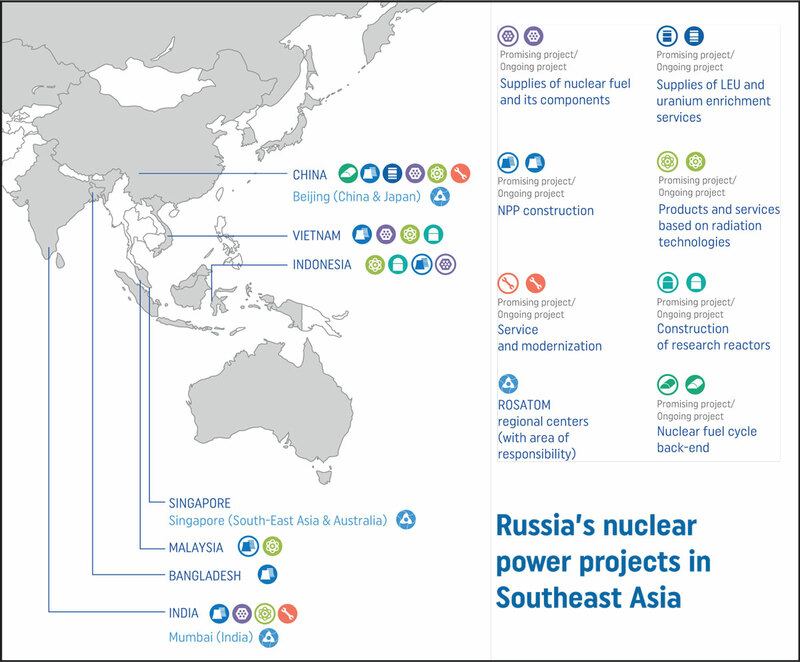 Since 2007 Russia and Myanmar have had an inter-governmental agreement regarding nuclear technology and building a nuclear research centre, according to Rosatom. Russia has trained more than 700 Myanmar students in nuclear and nuclear-related technologies in the past 10 years. The Russian state firm is seeking potential investment opportunities in the Southeast Asian region, and is offering comprehensive nuclear technology and experience, said Rosatom officials. The company is building two nuclear power units in Vietnam, and has also won a tender for the preliminary design of a 10-megawatt reactor in Indonesia (see map).